Our guide on starting a tile business covers all the essential information to help you decide if this business is a good match for you. Learn about the day-to-day activities of a tile business owner, the typical target market, growth potential, startup costs, legal considerations, and more! What happens during a typical day at a tile business? Most days at a tile store are spent managing retail traffic. Employees will let customers browse the showroom, answering any questions that might come up. Many tile showrooms offer clients an opportunity to actually see their designs before purchasing by making design software available on-site. Additional daily tasks include stocking the showroom’s inventory, rotating in-store and window displays, processing transactions, and scheduling any services that are required post-transaction. Store managers or owners will also need to handle administrative duties such as managing finances, the marketing strategy, and networking within the community. How does a tile business make money? Tile stores make money by selling and installing tile to individual customers and, in some cases, local contractors. Some retail establishments offer tile cleaning and repair services, depending upon the needs of their community. What is the growth potential for a tile business? A tile store has significant room for expansion. The key to realizing long-term growth is recognizing that there are many varied design tastes. By offering many tile options, you look to create a buying market for every potential customer. To expand from a local provider to a national retailer, however, your showroom should expand beyond tile, offering carpeting and other flooring options. The World Floor Covering Association and American Floorcovering Alliance both help members stay abreast of the latest in industry trends, tools, and technology. They can also assist in devising a sound marketing strategy and business plan. What are some skills and experiences that will help you build a successful tile business? A tile store owner should be well-versed in all types of flooring, with tile as their specialty. While it’s not necessary to be an installer, you’ll often be asked questions that require basic installation knowledge. Some experience in interior design would also prove beneficial. It is recommended that you spend a year or two working in a showroom or at a large home maintenance retailer. This will not only provide you with the knowledge needed to run a showroom, it will help in gaining a deeper understanding of how to communicate with consumers. As the owner, it’s also important to possess strong leadership skills, business acumen, and be able to communicate with a variety of different people. The relationships you build with suppliers will be as important as those built with customers and your staff. What are the costs involved in opening a tile business? Your greatest investment will be the actual retail space. Take the time to choose a location that’s easily accessible and offers ample parking. Rent and deposit costs vary from region to region, but experienced tile store owners advise budgeting between $2,500 to $5,000 to secure a location. Fixtures - To reduce costs, consider purchasing used whenever possible. You could also approach the tile distributors you’ve partnered with; many of them have displays designed specifically for showrooms. Inventory - This number varies depending upon how you wish to serve your customers and the retailers you partner with. Insurance - Speak with a professional to ensure your insurance needs are met. What are the steps to start a tile business? Form a legal entity. Establishing a legal business entity prevents you from being personally liable if your tile business is sued. Open a business bank account. A dedicated checking account for your tile business keeps your finances organized and makes your business appear more professional to your customers. What are some insider tips for jump starting a tile business? While it’s tempting to fill your showroom with every available tile, consider getting to know the needs of your clients on a more personal level beforehand. Stay current with industry trends to stay current with customers' needs. Your target market includes both homeowners and businesses who are looking to update their homes/offices. Your marketing efforts should also include consumers who have suffered a loss such as a fire, flood, or other natural disaster. In addition to standard marketing strategies, such as social media platforms and local ad campaigns, consider approaching independent insurance adjusters to set up a referral program. Approach various home and business insurance carriers to find out what it would take to get added to their partner list. This is an effective way to build steady business and create a sound reputation in the community. Prior to opening your doors, you’ll want to have compiled a team of professional and knowledgeable employees. As your business starts to realize significant growth, you will need to consider adding to your showroom team. Certain state permits and licenses may be needed to operate a tile business. Learn more about licensing requirements in your state by visiting SBA’s reference to state licenses and permits. Countertop businesses should require clients to sign a services agreement before starting a new project. This agreement should clarify client expectations and minimize risk of legal disputes by setting out payment terms and conditions, and service level expectations. Here is an example of such a service agreement. A tile business is generally run out of a workshop. Businesses operating out of a physical location typically require a Certificate of Occupancy (CO). A CO confirms that all building codes, zoning laws and government regulations have been met. Before leasing, confirm that your landlord has or can obtain a valid CO that is applicable to a tile business. Review all building codes and zoning requirements for your business’ location to ensure your tile business will be in compliance and able to obtain a CO.
Pricing varies, depending upon size, manufacturer, and quality of product. Average cost is $2-$5 per square foot. 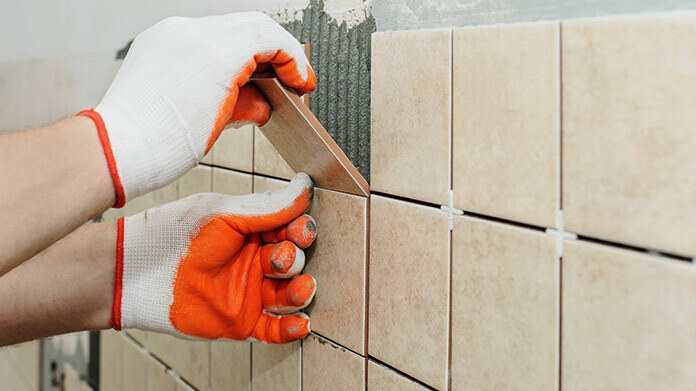 What are the ongoing expenses for a tile business? It’s recommended that you budget for a minimum of $5,000 monthly, depending upon how many workers you employ and how large your showroom is. How much profit can a tile business make? While is it always advised to budget for little to no profit the first one to three years, many tile stores report a profit of more than $50,000 their first year. Your business’ profits will start to see a steady incline, as your knowledge of the industry starts to grow. Although it requires additional licensing, adding tile installation to your list of services is the fastest way to increase profits. To remain competitive, most tile businesses offer additional flooring inventory and installation options, such as carpet and wood floors. As you get to know the needs of your clients, you could also consider selling the supplies needed for those do-it-yourself customers.